This week we celebrated Diwali, the Festival of Lights. It’s a major Hindu holiday that occurs every winter which involves getting together with your family, praying, lighting up every room in your house with diyas (little candles), exchanging gifts and watching the fireworks. For us, it’s a beautiful holiday with an important message. We live in a sometimes harsh and unforgiving world but when we light our candles on Diwali, we remember that light always triumphs over darkness, good must overcome evil and hope still exists. And then you get to stuff your face with sweets. 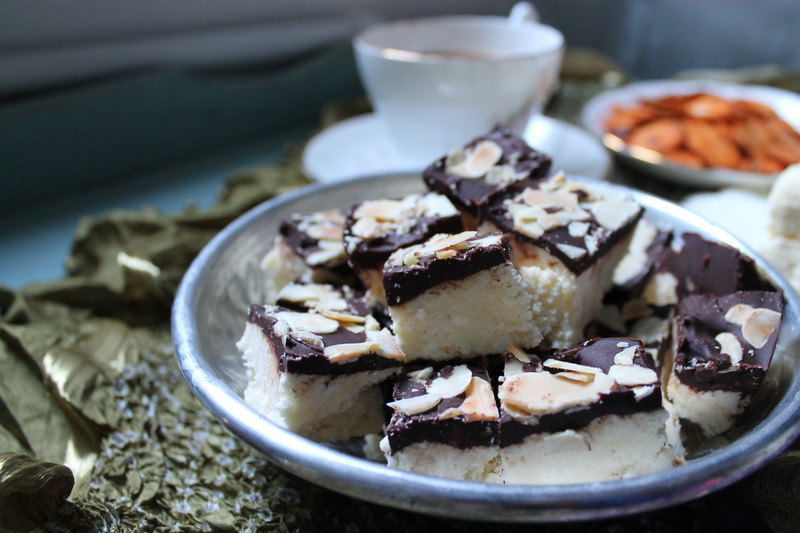 Which brings us onto the topic of this post – burfi or Indian fudge made with lots (and lots) of cream and sugar! If you ever happen to be near an Indian sweetshop, you’ll probably see rows and rows of brightly coloured fudge, sticky syrup dumplings and lovely neon orange spirals as well as samosas and other savoury goodies. Most of it is quite traditional, but if you’re lucky, you’ll spot some chocolate covered fudge which are naturally a favourite with children. The chocolate is never the best quality, but we never minded! 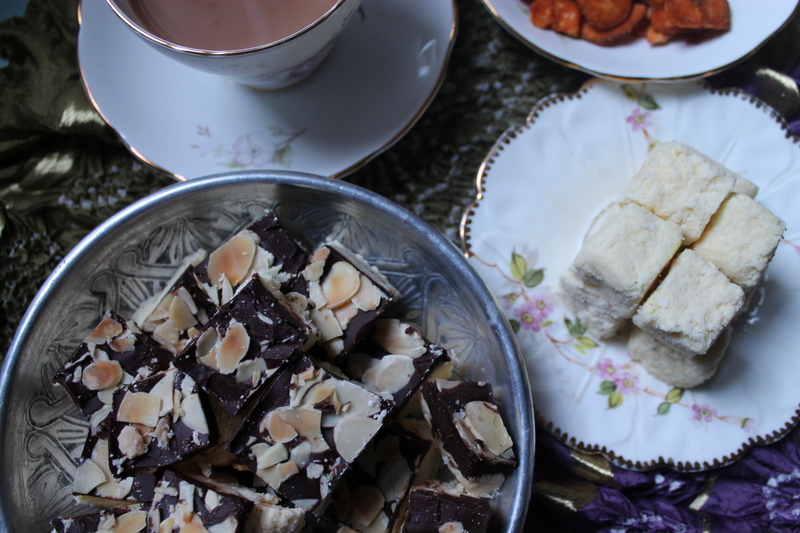 This year we decided to make our own chocolate burfi and sneak in some coconut because as you’re probably aware of by now, for us it’s a winning combination! Don’t be afraid of making your own Indian sweets, compared to Indian main dishes, there are very few ingredients involved and this recipe is all about chucking things into a pan and stirring – our favourite cooking technique! Boil the cream in a non-stick saucepan (VERY important). After boiling, then add the sugar and turn down the heat to a simmer. Using a candy thermometer, heat until the temperature of the mixture reaches 220C. Don’t worry if this seems to take a long time! Add the milk powder, coconut and cardamom and stir confidently – it’ll be a thick mixture. Keep on low heat for a couple of minutes, but careful not to let it burn. Pour the mixture into a greased baking dish (or two) and leave to set either in a cool place or in the fridge. 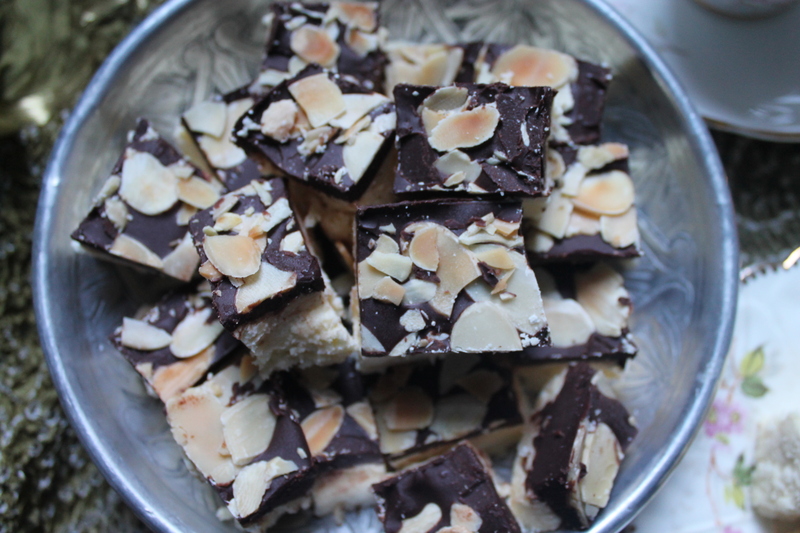 Melt the chocolate in a bain marie – then pour onto the chilled burfi and sprinkle with the almonds. Leave to set. Eat immediately with tea or keep in an airtight tin for a few days.